Jo Linsdell is the brains behind Promo Day. Born in Gillingham, Kent (UK), Jo left England and moved to Rome, Italy in June 2001, where she now lives with her husband and their two sons. She is a best-selling author and illustrator, award-winning blogger and freelance writer. A recognised thought leader in the world of book marketing she is also the CEO of Writers and Authors. Google+ launched in June 2011 and became the fastest growing social network in history when it reached 25 million users in less than 30 days. Google+ has some great features that make it ideal for writers and it's gaining popularity at a rapid rate... and for some very good reasons. Facebook has recently caused some upset amongst its users with changes to the site and many are jumping ship and moving to Google+. Whilst I'm personally a fan of Facebook and have no intention of leaving the social media giant any time soon I'm also a BIG fan of Google+ (you can find me at +Jo Linsdell). The hangouts feature alone has me sold on it! Free online video conferencing that can be streamed live to YouTube AND it's packed with other features too. You can even share documents during your video chat! This webinar will take you through the step by step process of setting up a hangout and take a closer look at the features that are most useful to writers. 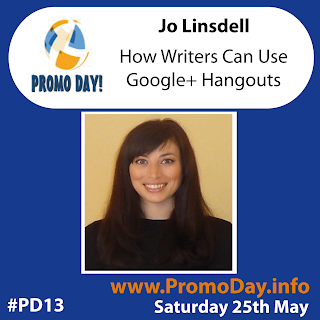 I'll also be giving you a few ideas for how you can use hangouts to market your books and build your author brand. Watch this free webinar for FREE at Promo Day on Saturday 25th May.